Ihave a serious problem with GenPro and can't recieve help! You can always use another email client rather than the forum to send email e.g. Outlook, gmail etc. using the email address I provided elesewhere. There may not be an early solution to your issue, given that the last release of GenoPro was over three years ago. Perhaps it is better to look for a work around. As I understand it your problem relates to images actually displayed on the genogram. I suggest that you try using thumbnail images of the actual size required, say 250x250 pixels, instead of the full full images. You can use Irfanview to create thumbnails in batch mode and reduce the image size considerably. So, I reduce em all to say 100 kbt, but I'm doubt that helps. 3. I can't find how to open place dialog in GenPro? What menu? Thanks for advise. I made most of photos 250x250 pixels and it works! 2. Glad that 250x250 works for you. Maybe other photos that are not displayed on genogram can still be full size. 3. to see Place dialog put cursor in place field and key Ctrl & E or right click for context menu then chose edit place e.g. 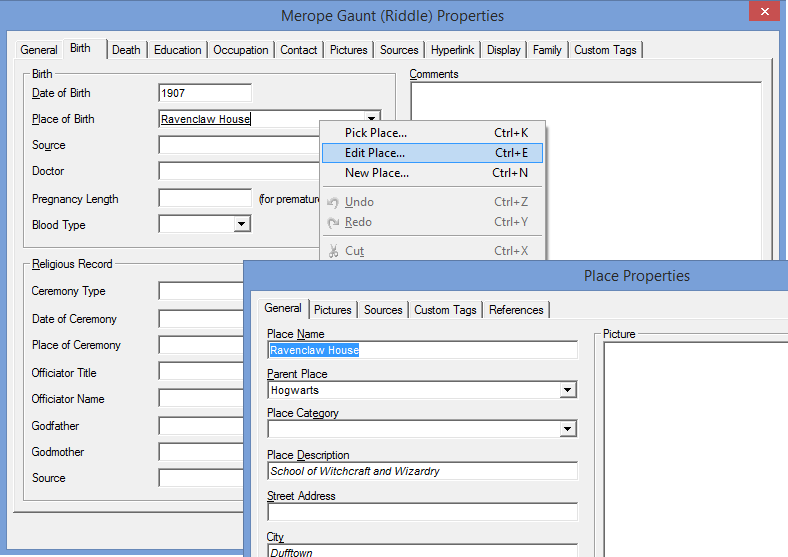 You can also open it from from Table Layout, Places and Locations, by clicking Properties icon or pressing Enter when positioned on text field (not hyperlink). The tool tip on Properties icon indicates Ctrl & I but this does not work for me.